RBTH editors remember the tastiest treats of their youth. There were no Snickers, Mars bars, Oreos, or Nutella during the days of the Soviet Union, but other sweets existed that Russians remember with delight to this day. What could be tastier than a piece of white, freshly baked bread slathered with a thick layer of cold butter, sprinkled with sugar? "This was the best treat of my childhood," says Anna Sorokina. "Sometimes my parents would buy chocolate butter instead. If you wanted to mix things up, there was homemade raspberry, blackcurrant, or cherry jam. It was really delicious." Kartoshka cakes are one of the most famous Soviet desserts. They were originally prepared at the legendary Praga restaurant on Arbat Street in Moscow, in student cafeterias, and at home. So what’s the secret behind the pudding’s popularity? The recipe for Kartoshka cakes uses leftovers from sponge cakes, crumbled cookies, and stale toast. The remnants of gingerbread are also used. “When I was five-years-old, homemade caramel in spoon is what my grandma used to make to lure me home from the street,” says Nikolay Shevchenko. “She would take a spoonful of sugar and hold it over a stove.” It doesn’t take long before the sugar starts melting, and sweet burnt fumes fill the air. Everyone from the Soviet Union associates this with their childhood. How do you make it? Take the spoon off the stove and allow the dark brown, melted sugar to cool down and let it crystallize for a minute or two. Then give it a try. It’s chewy, so takes a while to eat, but the child will be begging for another one as soon as it’s finished - there’s no better way to grab a kid’s attention. From the Soviet times to today, chocolate candy in colorful wrappers has always attracted kids, adults, and Chinese tourists! "Bear in the North," "Squirrel," "Stratosphere," "Red Hood" - there were many to choose from and each had a funny name. "The first thing that came to my mind when I was asked about my favorite ‘yummy’ from childhood is soya mini bars from the Rot Front factory, they are just so delicious! My mom hid them from me, but I always found them and could eat the entire packet!" Alexandra Guzeva recalls. Long before Coca-Cola, Fanta, and other American soft drinks appeared in Russia, kids were obsessed with red, orange, and green sweet soda drinks... “Sitro,” “Buratino (Russian Pinocchio),” “Sayan (named after the Siberian mountain range),” “Little Bell” - there were many varieties of this Soviet carbonated drink. You can still find many of them in Russian stores today. "Probably everyone who grew up in the Soviet Union remembers those vending machines where you could take still water for free and add sweet syrup for a small price - it was great! Everyone drunk from the same glass - in the Soviet Union everyone was brother and sister!" Alexandra Guzeva laughs. It’s not known who first decided to boil condensed milk, but every Soviet child knew how to do it. However, it has to be done carefully. If the tin of condensed milk is left in the water for too long, and it all evaporates, it can explode and daub the walls and ceiling in sweet, sticky goo. If done correctly, you can create a milky, caramel paste that can be eaten with a spoon. It can also be used as a filling for desserts, such as waffle rolls, and put inside shortcake dough. Today boiled condensed milk can be found in every Russian shop, so there’s no need to make it at home. Soviet children recall with nostalgia how they tried to eat this sugary mess as quickly as possible before it melted, and how sticky their hands were afterwards. Cotton candy was a rare treat and something special. 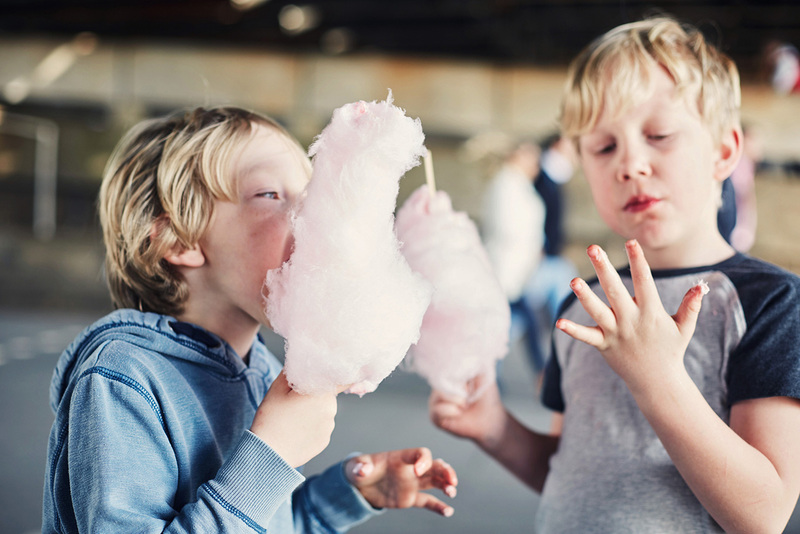 "I always associated this sugar explosion with the summer and weekend walks with my parents in Moscow Zoo or Gorky Park - cotton candy was not sold everywhere. You had to be careful though, because it attracted wasps who would try to eat the candy! Alexandra Guzeva says. Soviet donuts were not like donuts found today in America, which are glazed or filled with jam. Back then there was only one type - donuts with a dusting of sugar power. "I remember that for some reason they were only sold in the circus and as I was lucky to grow up not far from the Big Moscow Circus, so I ate them from time to time. My whole face would be covered in sugar powder but you can't even imagine how happy my face looked!" Alexandra Guzeva says. The only problem - after the donuts cooled down they were nowhere near as nice. This Oriental sweet made from sunflower seeds was very popular among Soviet children. There was no shortage of the candy, so it wasn’t so much of a delicacy - more of a regular treat. It was usually sold in huge bales and chopped into pieces like ice. Halva in chocolate was super delicious, and even today it remains a popular candy in Russia. What are your favorite yummies from the childhood?